Summer 2010 saw a new online accounting system come into life. QuickFile, a new cloud accounting platform, has been built from the ground up and focuses on what small business owners need in order to carry out their accounting responsibilities. One of the main focuses of QuickFile is to save business owners time by introducing some new concepts when it comes to how accounting is carried out. QuickFile allows businesses to upload their bank statement and then tag the transactions to corresponding invoices, categories or clients. The system can also suggest other similar entries and allow you to bulk tag them, and even create the relevant sales invoices or receipts in the background with little action required from the user. Businesses are now able to scan and upload their receipts and attach them to individual purchases or sales. Having all receipts organised like this can make it easier to carry out audits and answer any HMRC enquiries. This is made simple when using an app such as CamScanner, which is used to take a photo of your receipt, converts it to PDF and then uploads it straight to the Receipt Hub. Quickfile acts as one big report, allowing businesses to navigate around their accounts easily and see real-time charts and graphs. This makes it easy to see the breakdown of income and expenses filtered in any way which is useful for the individual business. If a client specifically requires a hard copy invoice or account statement, QuickFile can take care of this too. 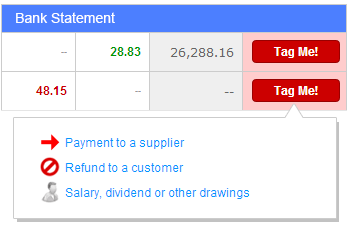 At the click of a button QuickFile prints and sends the invoice or account statement straight to your client for you. If this is requested, the business gets a record of the item being sent, which can help resolve any disputes about it being received. QuickFile allows businesses to have a fully branded client area, which allows clients to view, print, download and pay their invoices online. By linking the businesses account to services such as Worldpay, PayPal, SagePay and GoCardless, payments can be made instantly. Theres also the option of creating estimates and recurring invoices which can be sent to the clients and help cut down on administration. QuickFile is integrated with HMRC to enable VAT returns to be generated and filed electronically. QuickFile supports both cash and accrual accounting for VAT, along with the flat-rate VAT scheme. If business owners arent sure where to start with their end of year accounting, QuickFile can put them into contact with a number of accountants. This process is made simple and straightforward with facilitating price comparison, easy communication and document sharing. This means businesses always have the choice between the accountant they want to go with and at a competitive price too. Being free for small accounts and only £45 +VAT per year for larger accounts, QuickFile is a competitively priced online accounting system. With a range of other services that can help with recording and submitting VAT, as well as helping with bookkeeping, QuickFile is a well rounded system that can help businesses of any size.